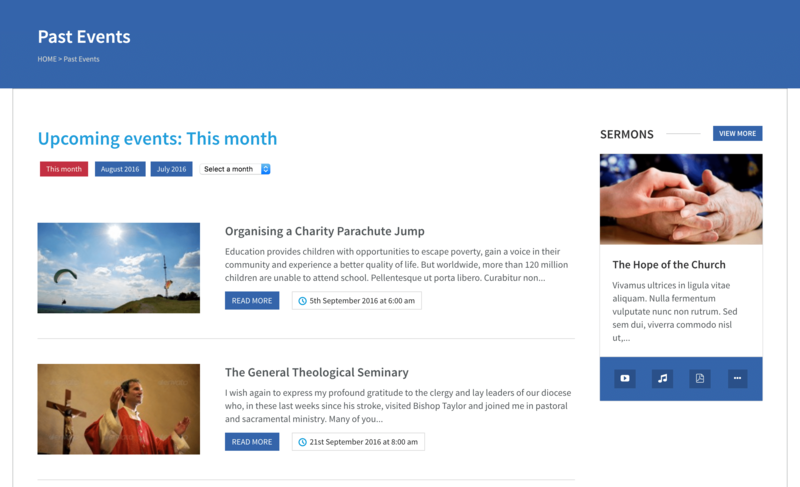 The Benevolence theme comes with three page templates to display Events. By default, the Events: List template displays all the events which are yet to occur in the current month, including an entry for each occurrence of a repeating event. The navigation at the top of the page content has automatically generated buttons for the following two months. When selected, the buttons lead to pages which display all of the events for that month. The Events: Past template works in a similar manner to the Events: List template. By default, it displays all of the events which have already occurred in the current month. It also features buttons for the previous two months, and a dropdown for the previous six months before that. 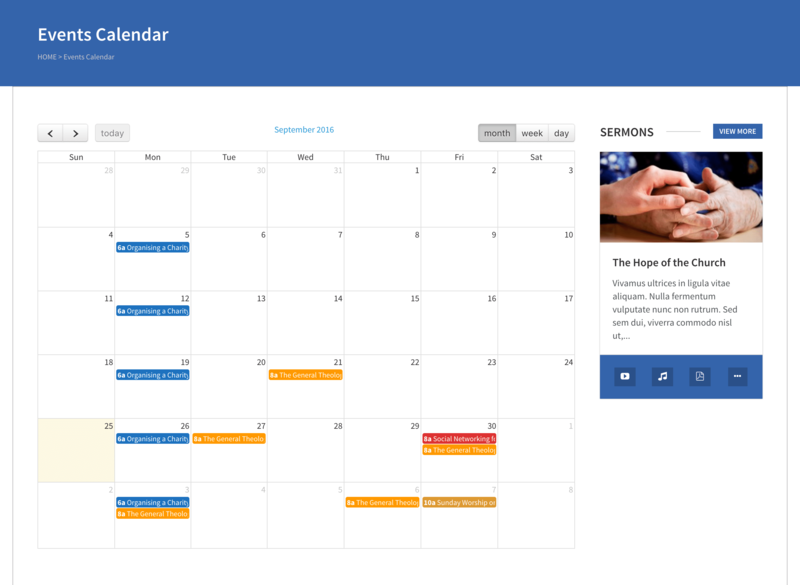 The Events: Calendar template displays both current and previous events in a monthly, weekly or daily calendar. The event colours can be changed in Event Options. To display events using any of these templates, first create a new page by selecting Pages → Add New from the main menu. You can name this page whatever you like, give it a header image, etc. The Add New Page screen, with the Template field highlighted. Importantly, select either Events: List, Events: Past or Events: Calendar from the Template section of the Page Attributes box. Save the page. Your events will now be displayed on that page. Add the page to a menu using Appearance → Menus, or link to it from elsewhere on your site, to make your events page accessible to users. 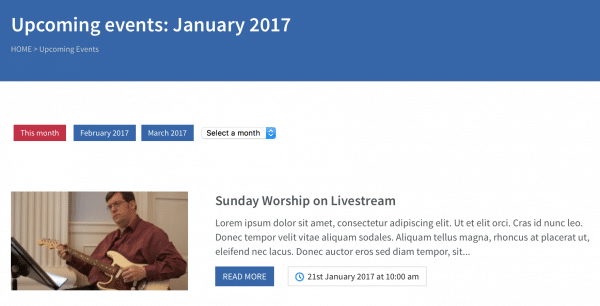 Both the Events: List and Events: Past page templates include additional options for customising how the events on these pages are displayed. Pagination: If pagination is enabled, the standard system of displaying events by month will be disabled, and replaced with a list of events. The number of months of events displayed will still be controlled by the Duration field. This works well on sites with few events, split over multiple months. Top of an events page with pagination disabled. Bottom of an events page with pagination enabled. Events per page: If the pagination is enabled, the number of events displayed on one page can be configured here. Duration: Select how many months of events this page will display. In the case of displaying events month by month, this is how many months links are provided to. In the case of pagination, this is means how many months of events will be displayed. 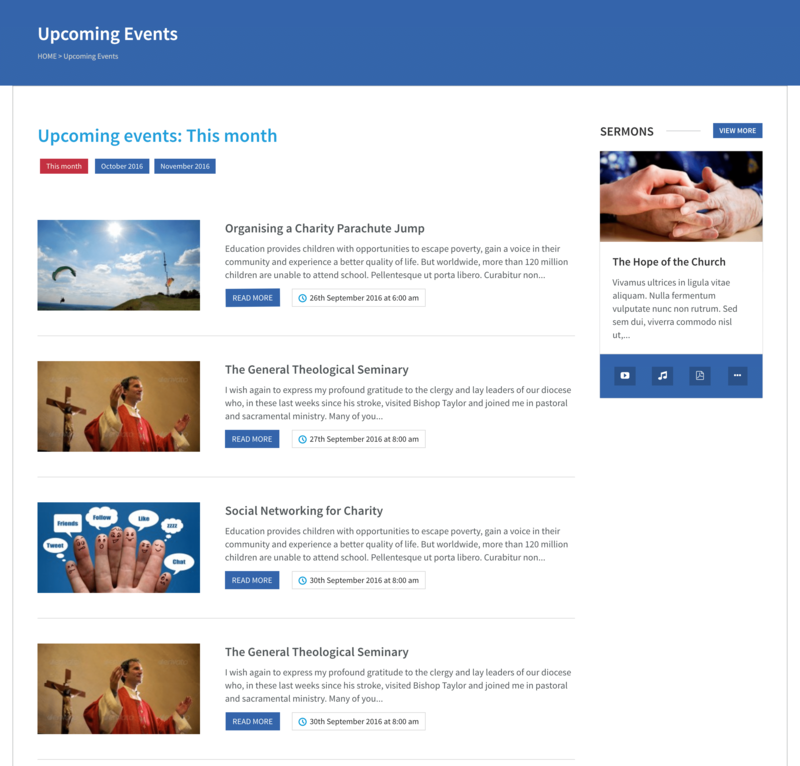 Similar options can be configured for the events category pages in Theme Options.